Well, I thought it was about time we started having some seafood recipes, so here's the first one. 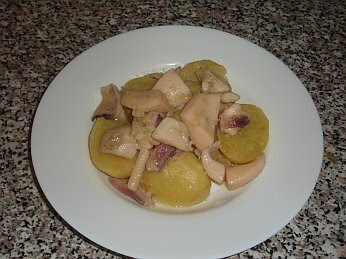 The cuttlefish - or soupyes - can be eaten this way either with potatoes (see photo) or rice as a kind of risotto. Another easy Greek recipe to prepare! Remove the ink and the eye, rinse the cuttlefish extremely thoroughly and cut it into small pieces. Put the olive oil into a shallow pan, add the garlic and start frying. Add the cuttlefish and continue frying for another 5 minutes. Add 1 litre of water plus salt and pepper and boil for 1 hour. Then add either the potatoes or the rice and cook for a further 20 minutes. By then the mixture will have thickened and you will have either a risotto or cuttlefish with potatoes. Let me try this one. Thanks for sharing. Sounds like a great dish! Do you have instructions on how to clean the cuttlefish? When you talk about removing the ink and the eye, it sounds like it could ruin the meat if done wrong. Won't the extended cooking time make the cuttlefish feel rubbery? look yummy, I'll your recipe tomorrow .